My son and I love the Papa Murphy’s Chicago Style Stuffed Pizza….so good. With these Papa Murphy’s coupons to save us money we get to indulge a little more often too! So check out all the coupons below and save some money on your next Papa Murphy’s order as well. We always have the newest and best coupons right here. What’s better than pizza and a movie? Check out our free Redbox codes page and grab your self a movie free too! Download for Papa Murphy’s App for More Deals! 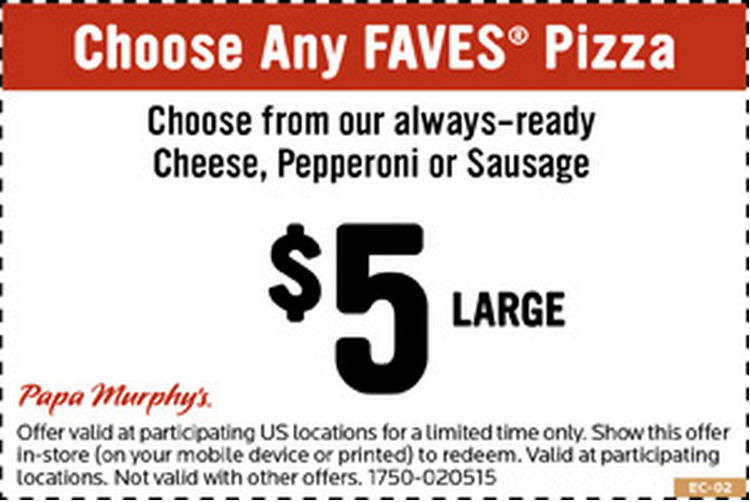 Most Papa Murphy's locations do offer a military discount that is usually even better than the Papa Murphy's coupons! Typically the stores will give you 50% off any one pizza with a valid military ID. SWEET right!?! Not all locations may offer the military discount or they may have a different percent off. But most seem to give the 50% off. It does not appear that Papa Murphy's offers a senior discount. Join Papa Murphy's Dinner Circle and get email deals or mobile deals. Once you agree to text submission, there will be a confirmation text and then you will receive text deals on pizza until you say STOP! If you sign up for emails, they will send coupon's in your email. You get the freshest ingredients with the freshest pizza's at Papa Murphy's. You also get fresh baked pizza because they are take and bake. You get to eat hot out of the oven every time. Every Papa Murphy's pizza is built to perfection with exactly what you want. You select the type of crust and your favorite fresh ingredients. We make your pizza by hand in a matter of minutes. Then you take it home, pop it in the oven, and serve it fresh to your family. That's what we call Love at 425°.